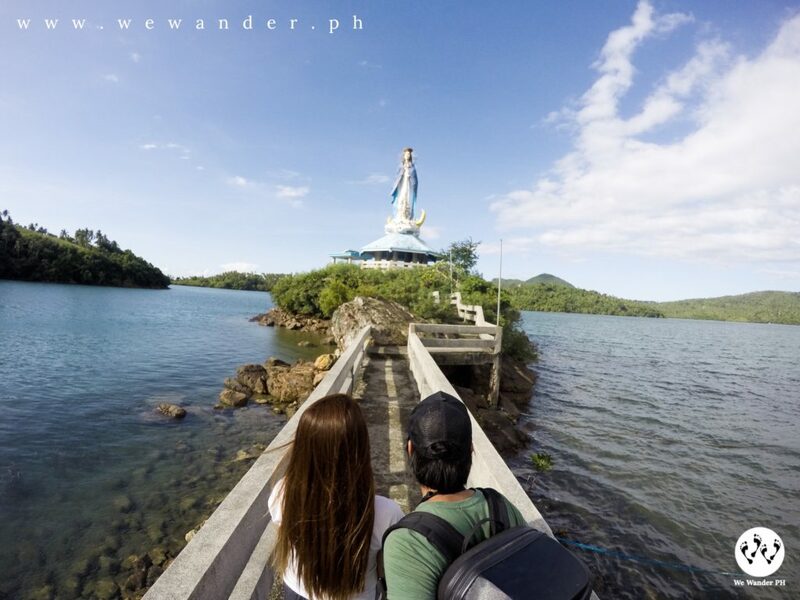 The island of Marinduque is a place where you can find that inner peace to reconnect yourself. The place is raw, steady and rejuvenating. Here, there are no malls and towering buildings. No loud noises of city traffic and no pollution at all. Sounds like a good place, yes? Before you jump into excitement, you need to know how to get there. You can choose via public transportation, package tours or road-tripping. 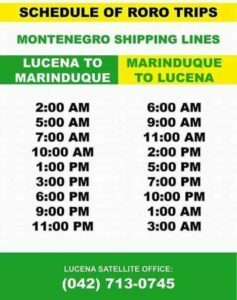 Daily trip schedules are being offered by Jac Liner from their Cubao and Buendia terminal stations going to Marinduque. The ride includes the ferry ticket and terminal fee being collected in the port. This option is good for those who prefer a convenient way to travel to Marinduque. Check the table as reference. This choice is like Option A, following the same route. The difference is, you are going to do it on your own. 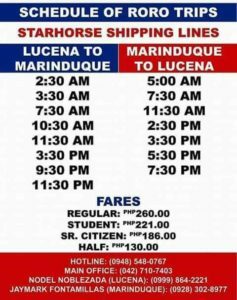 Ride a Jac Liner bus bound to Dalahican Port in Lucena and buy your ferry ticket on the two available Shipping Line Companies – Starhorse Shipping Lines and Montenegro Shipping Lines. 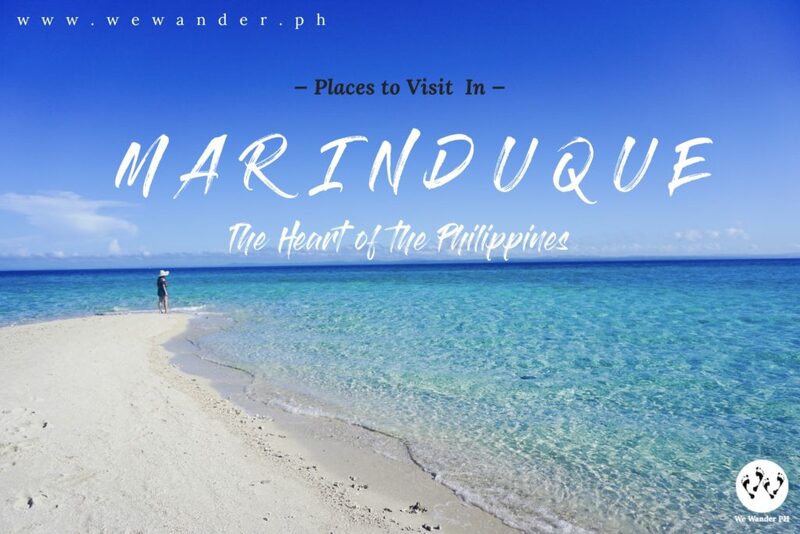 Credits: Jay-Em Moreno Posas, Admin of Marinduque Island Heart of the Philippines facebook page. 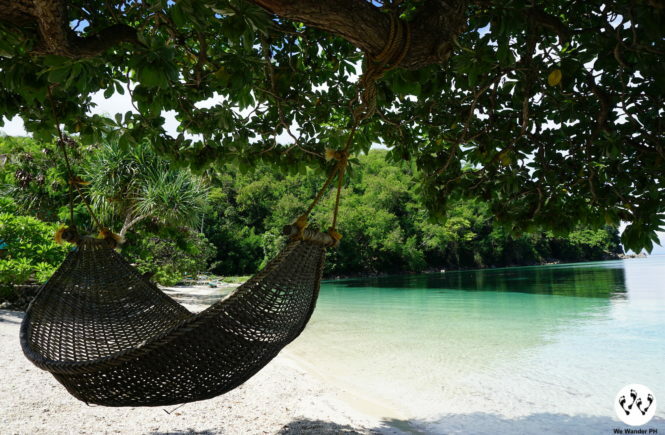 If you want to skip the ferry ride, this option is your best pick. You would need to ride a bus bound to Lucena Grand Terminal. Aside from Jac Liner, we have Jam Liner as another option to get you there. From Lucena Grand Terminal, you can take a ride from van(s) heading to General Luna. Travel time may take 2 – 3 hours. Tell the driver to drop you off at General Luna. From here, you need to ride a tricycle going to General Luna Port. At General Luna Port, there is a boat scheduled at 10am directly going to Maniwaya Island. You can ask the boatman where they can drop you off. Make sure that you pre-arranged your resort accommodation. You may also want to ask what time is the boat schedule returning from Maniwaya to General Luna so you can plan your itinerary and stay. For those coming in groups, you can rent a whole boat to take you to Maniwaya Island. Price range is from P6,000 – P8,000. 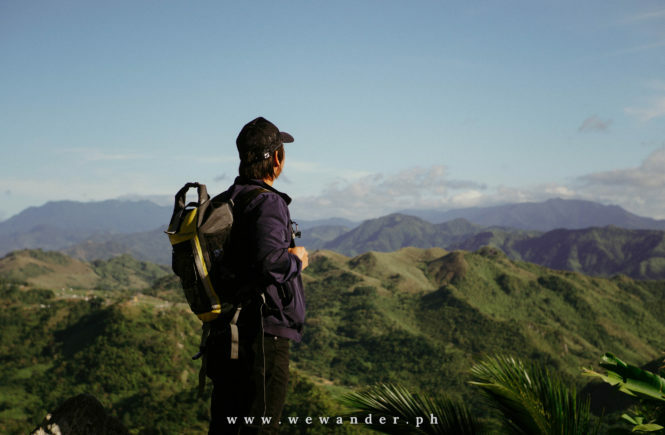 If you are a passionate driver and you want a road trip experience, you can settle on using your car for a one of a kind Marinduque adventure. And we can vouch on that! We Wander PH opted to explore the island with a car and it’s one of the most satisfying and rewarding travel that we had. There are numerous benefits of using your private vehicle. One, you are in control of your time and itineraries. 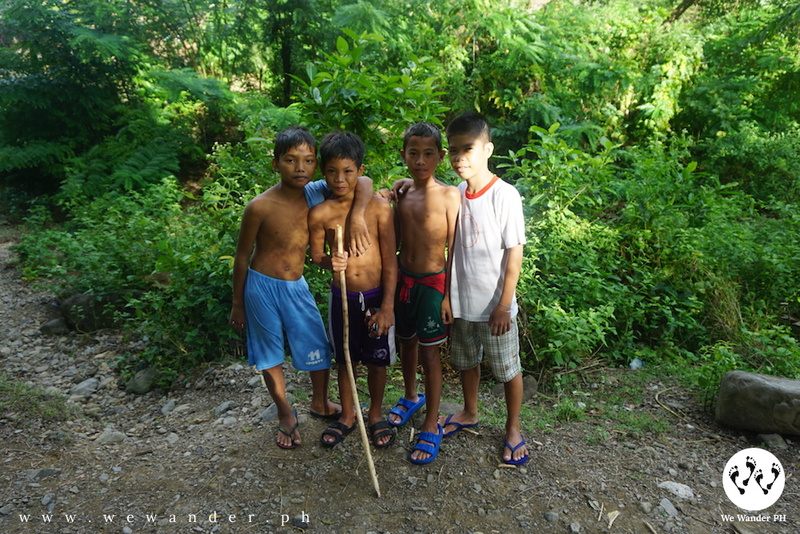 Two, you do not need to worry about the last trip of the jeepney or van going around Marinduque. Three, there is no traffic in the whole island. You can drive the whole Marinduque from north to south and back in less than a day. Four, convenient travel especially when you are with your squad. Five, breathtaking views that only you can spot as you can stop anywhere and anytime. And, many more to count! Doing this option, you just need to follow the routes from Option A. 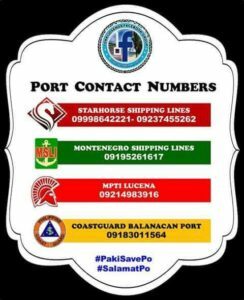 From Manila, drive all the way down to Lucena straight to Dalahican Port where you need to pay for terminal fee and for the car freight. As per our visit last December 2017, the car fare includes the fee for the driver and one passenger. So, if you are coming as a big group, the car fare is decent enough. The ferry ride will last up to 2.5 – 3 hours and it is best to grab the earliest schedule at 2:30am (Starhorse) or 2am (Montenegro). We arrived in Balanacan Port before 5am and rushed to Poctoy White Beach in Torrijos to witness the sunrise. 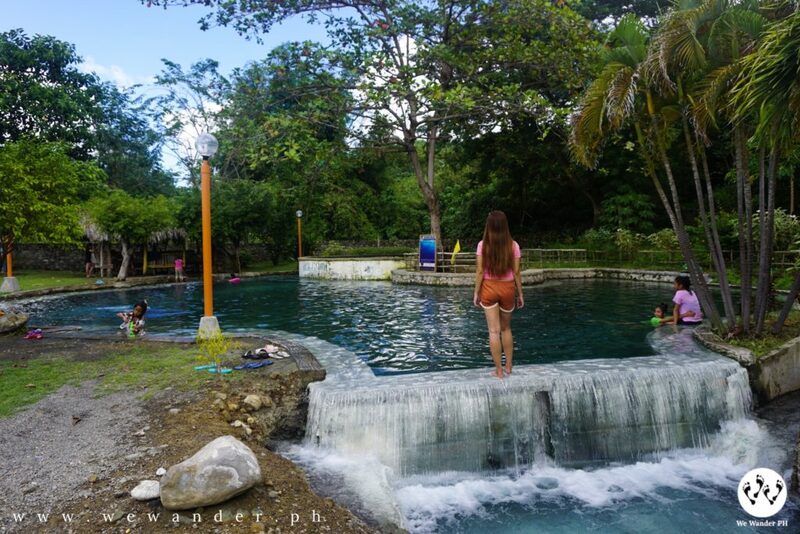 It is located in the south eastern part of Marinduque that will take you an hour. This is the first part of our itinerary. In Poctoy, you can do kayaking, snorkeling, boat ride and many more. They also offer boat rental for Maniwaya, Ungab Rock Formation and Palad Sand Bar. 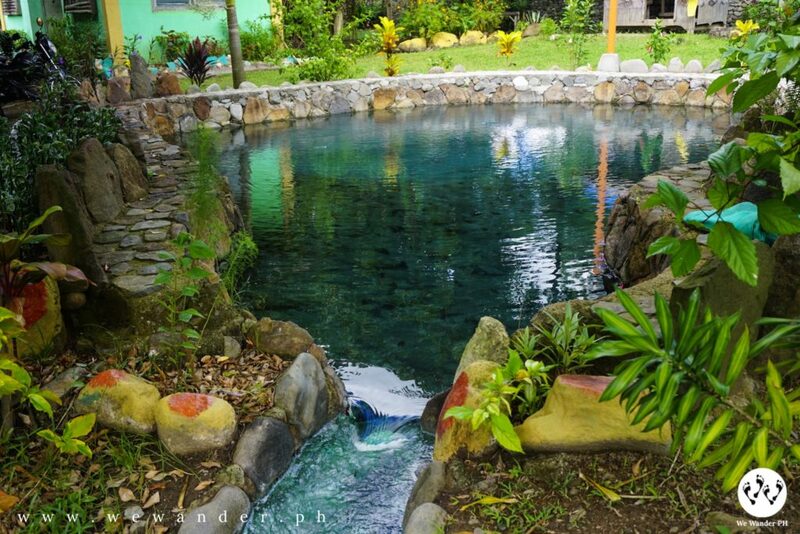 After a half day stay in Poctoy, we headed to Malbog Sulfuric Hot Spring Resort in Buenavista, Marinduque. Yes, its real. You can smell the sulfur around the place. The water is a natural spring from the ground connected from Mt. 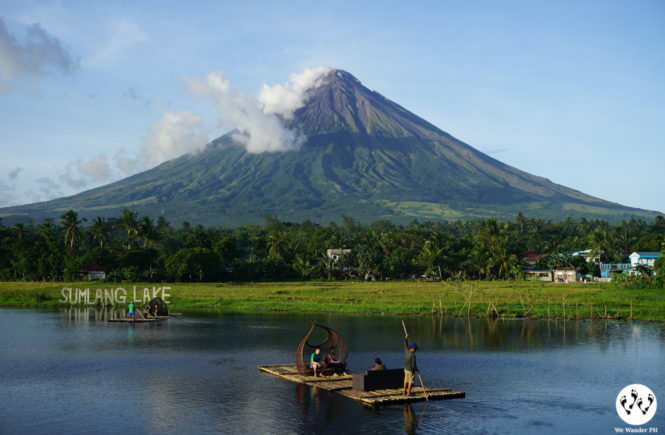 Malindig (Malindig Volcano). 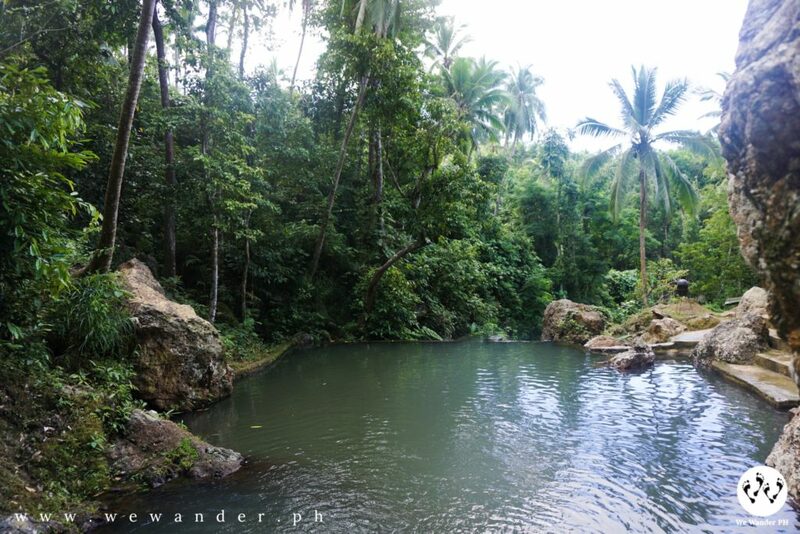 From here, our next stop is the Bulusukan Falls. Before you plan to go here, you must be ready for trekking for about 1 hour depending on your pace. Bulusakan has multiple-layered falls but we just reached it’s second layer to consider the time we got there, mid afternoon. 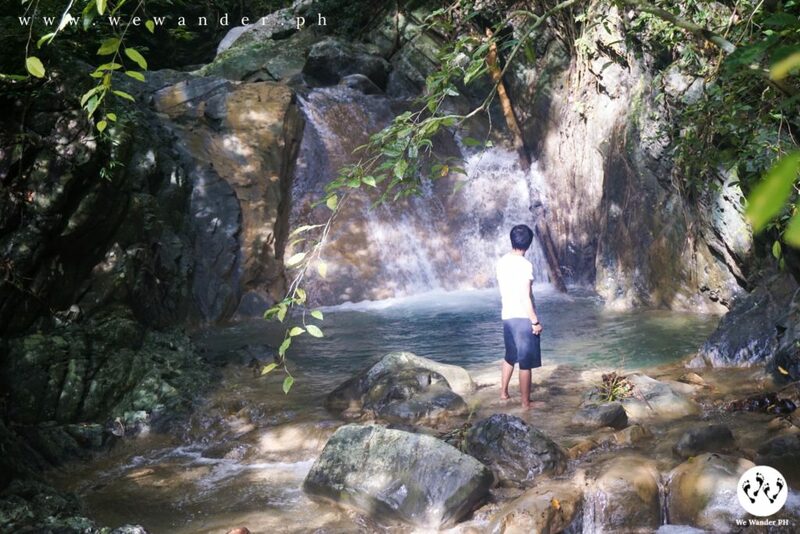 There is a part that you need to climb to get to the second layer and the same will apply if you want to go beyond the other part of Bulusukan falls. And what’s memorable about our experience here? We were guided by kids! There were five of them and we had so much fun talking and laughing with them. 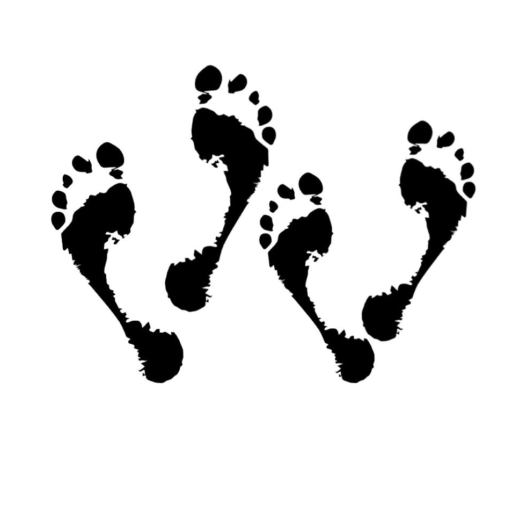 Guide is not required but based on our experience, trekking and going to the trail, doing the river crossing, you should not doubt getting one. We paid them, though not compulsory. Give them reasonable amount for their effort and time and you wont regret it. They will give you their genuine smile in return. Gasan is less than an hour away from Buenavista. You can spend the night here and choose to explore the Tres Reyes Islands of Gaspar Island, Melchor Island and Baltazar Island the following day. We decided to skip it and drove straight to Boac, the first class municipality and capital of Marinduque. It is home for the heritage houses, the Boac Cathedral, and numerous local restaurants that you need to check and dine. 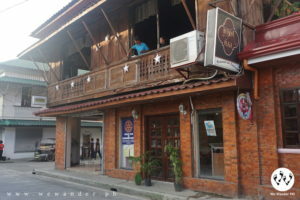 Kusina sa Plaza is probably one of the locals and tourists’ favorite. 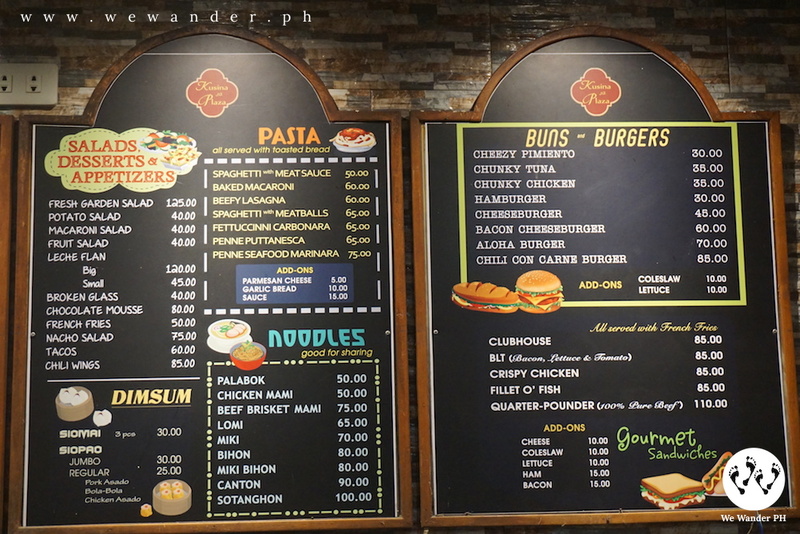 This local restaurant in Boac, Marinduque serve various menus from salads, burgers, noodles, desserts, pizzas and a lot more. 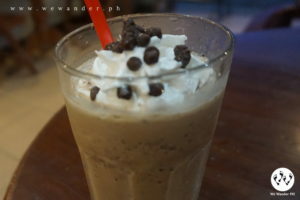 And of course, they have Cafe Ma ‘Mita beside Boac Hotel. We recommend their “Sinigang na Hipon” and “Lechon Kawali”. You will know why once tasted. Yum! Yum! 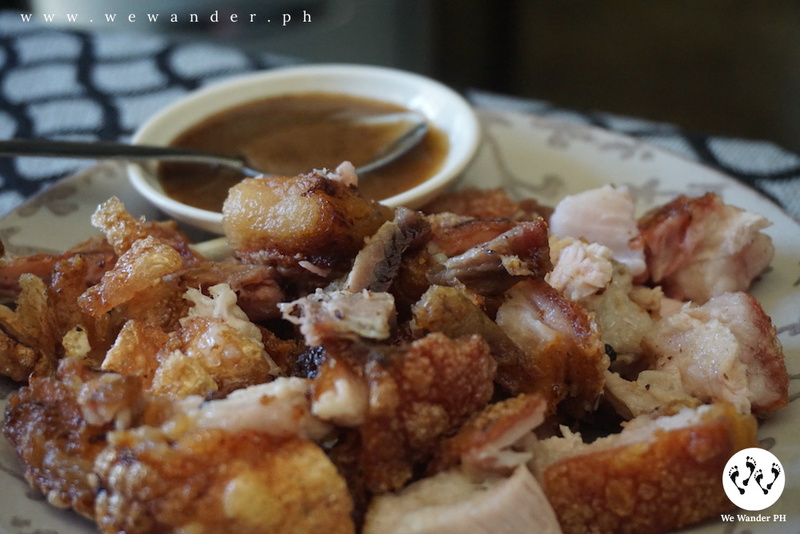 Special Lechon Paksiw, a must eat! The same establishment, you can buy your “pasalubong” and souvenirs. 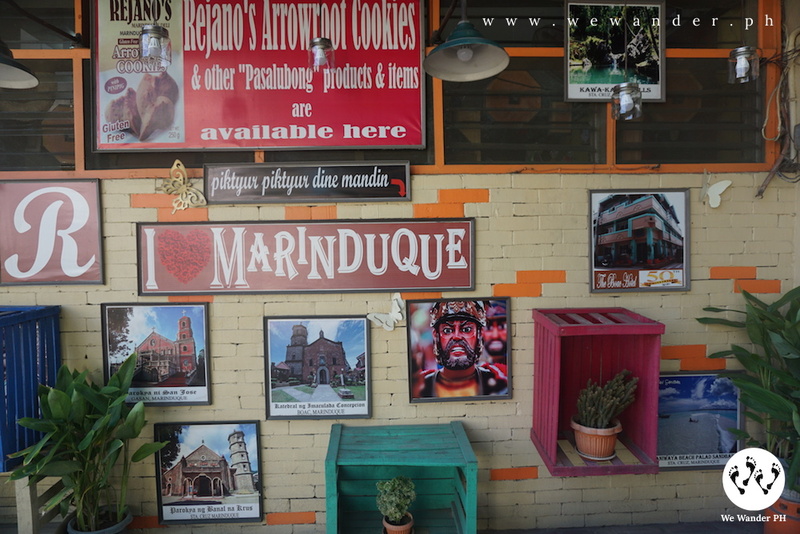 They have the infamous Rejano’s Arrowroot Cookies and many other Marinduque-made goodies. 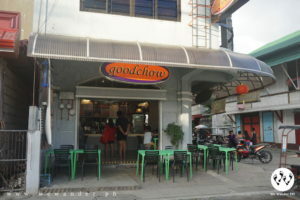 Another good place to eat is Good Chow, they have different rice meals, pasta and sweets. For hotels and accommodations, we tried to get a hotel room the same day and to be honest, it’s unwise. Almost all of them were fully-booked or occupied. Thankfully, we found Boac Hotel, the oldest standing and running hotel in Boac. Rates are reasonable and room space is good enough to spend the night. They serve welcome drinks for guests and includes free breakfast. As early as dawn, we packed our bags and start driving going to Sta. 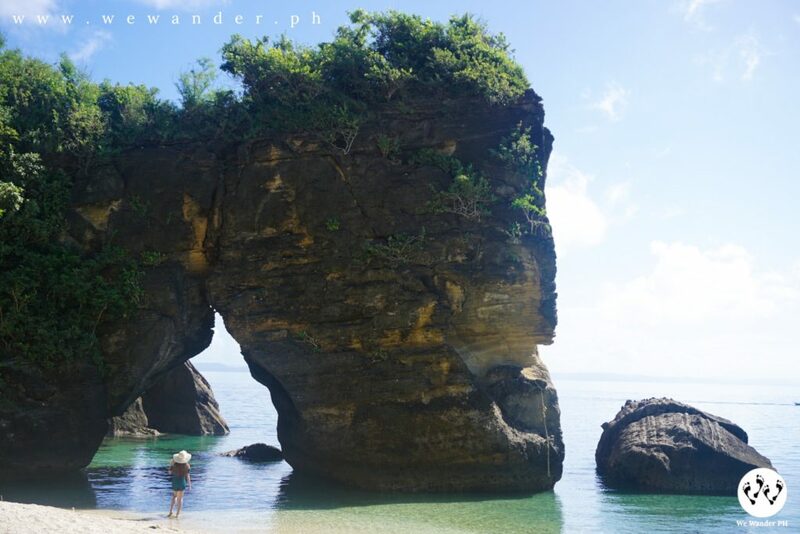 Cruz, Marinduque to wander around the well-known island of Maniwaya, the incredible Ungab Rock Formations and the stunning Palad Sand Bar. Boac to Sta. Cruz will take you 1 to 1.5 hours travel time. The roads are mostly rice fields, forests and overlooking views of coastal areas. Buyabod Port is the place to get the boat for rental going to Maniwaya Island. Landmark to remember when you reached Sta. Cruz is the huge Moriones Statue. 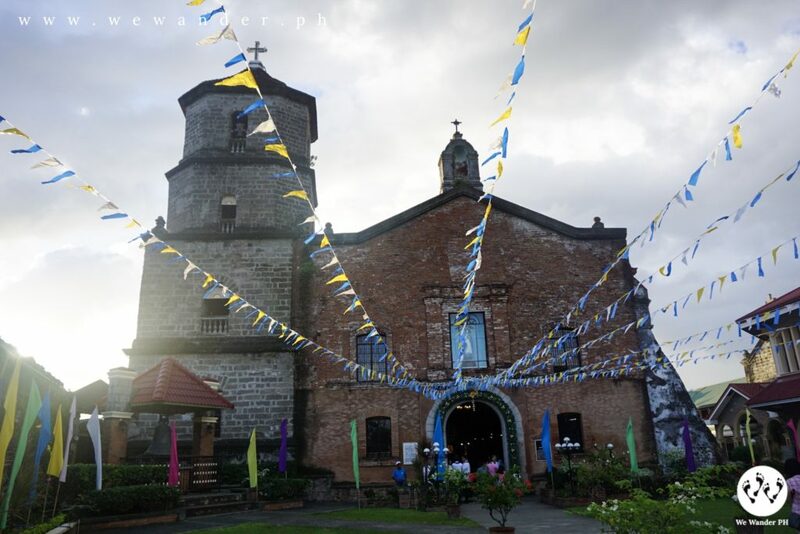 In front the Holy Cross Parish Church is located. From here, the port is less than 30-minutes away. Good thing about Buyabod Port, there are designated parking areas inside with gates and fences. And no worries, people of Marinduque are kind and accommodating. It’s not hard to find and arrange the boat to start the island hopping. 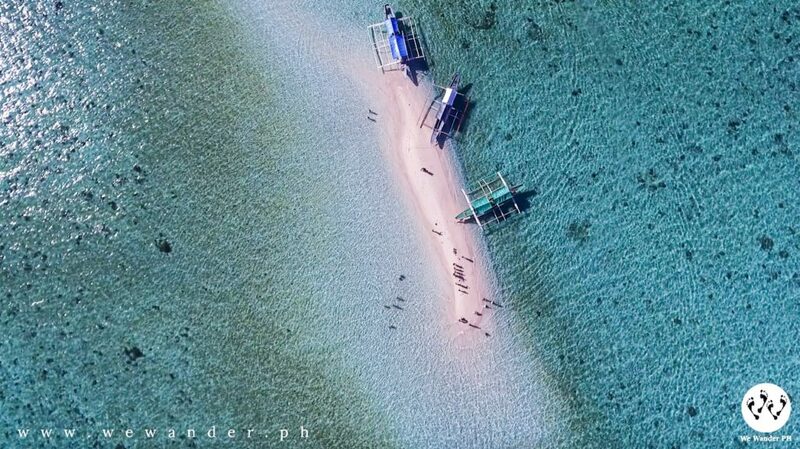 To start the island hopping, the first stop would be the Palad Sand Bar. This is 1 hour boat ride from the port. As per our boat captain, it is best to visit at dawn. 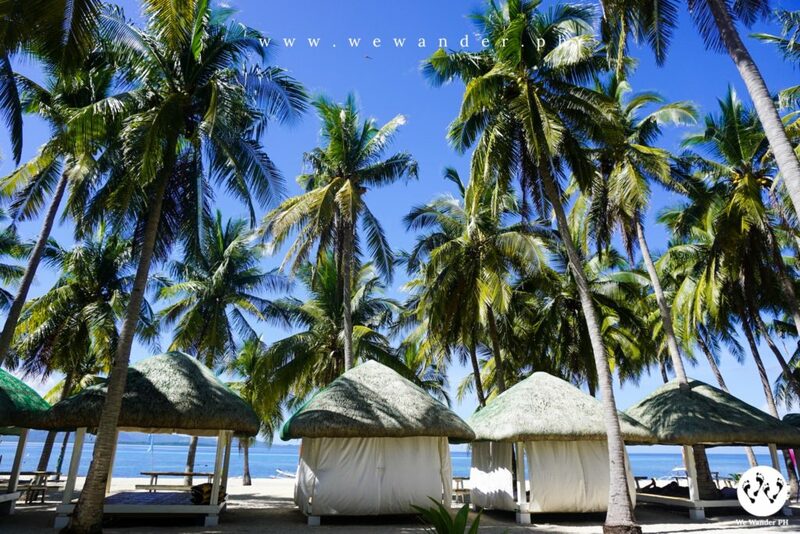 They can start the island hopping as early as 4am which will enable the tourist to watch the sun rise in Palad Sand Bar. We wished we’ve known this earlier! But still, we were amazed by its amazing crystal-clear water. This rock formation resembles a shape of an elephant. There are portions where you can climb to do cliff diving but we were not up to it at that time so we just enjoyed ourselves for some good swimming. We were lucky it’s just the two of us. We thanked our boat captain for such a good timing. This is located in Mompong Island. We talked with a local and learned that they are starting to accommodate tourist for overnight stay. They have camping tents for rent and may let their houses occupy by visitors if they wished. There is a small sari-sari store and offers the usual stuff for a quick bites. They may also prepare you meals like seafoods and adobo. You can contact Kuya Jay-R at 09070658463 should you wish to stay in Ungab, to cook for you and even provide you boat services. 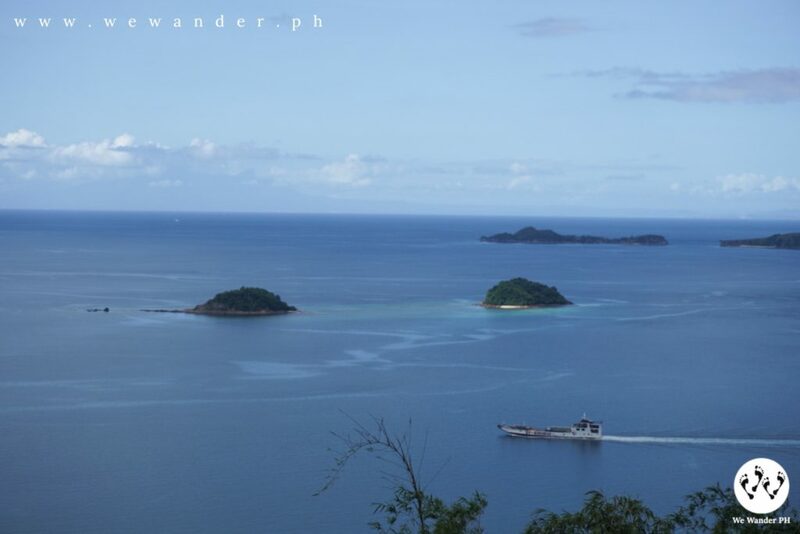 The trip will never be complete without experiencing Maniwaya Island. 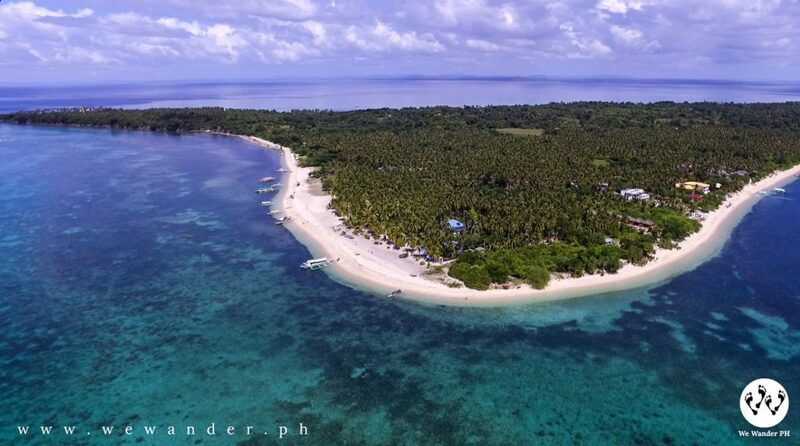 This place has always been the favorite getaway by many because of its accessibility, the vibes, and its stretched white to cream sand beaches. It has everything you need to get most out of your long-awaited vacay. They have restaurants, established hotel rooms and cottages, reliable electricity and other needful. We didn’t stay overnight in Maniwaya since we have other itineraries to accomplish. The Kawa-Kawa Falls in Sta. Cruz can be included in your sidetrip. The falls is simple and usually a place for family who want to have a quick go-to place. We get back to Boac Hotel late afternoon to freshen up and eat our dinner and then packed-up. We decided to try another hotel and checked-in to Tahanan sa Isok and stayed there overnight. The next morning, the third and last day in Marinduque, we went to Natangco Island. We decided not to include the itinerary here since as per local, the place was recently closed to public for personal reasons of the owner. We hope the island will re-open so we can share to everyone how beautiful it is. For now, let’s hope for the best. Since we only have half a day before our ferry schedule, it’s timely that we discovered the Balanacan View Deck. 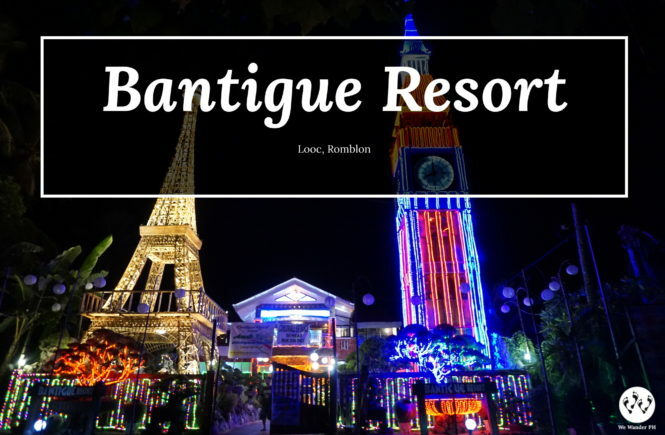 It is located along the way when you are coming from Balanacan Port to Boac. During that time, it’s still on construction but the place and the overlooking view is a must-see! 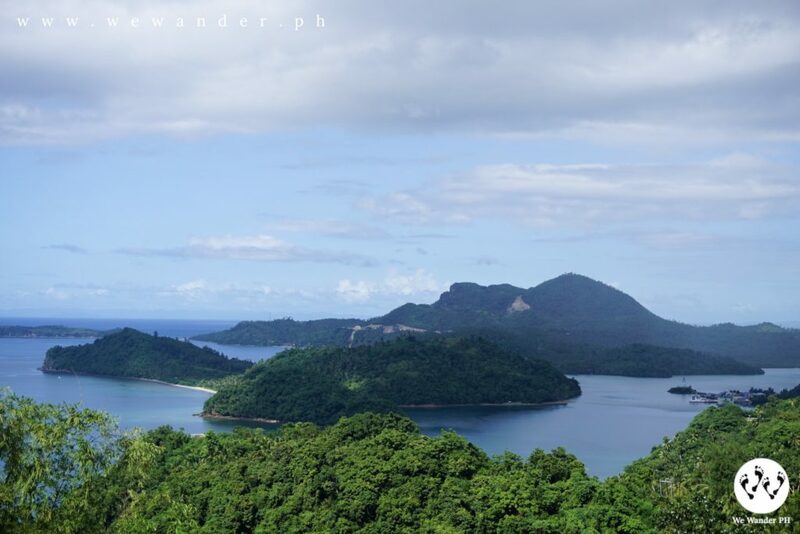 It was like we were in El Nido seeing this view. To cap off our Marinduque adventure, we dropped by to the Lady of Biglang Awa and the Moriones Statues in Balanacan Port. 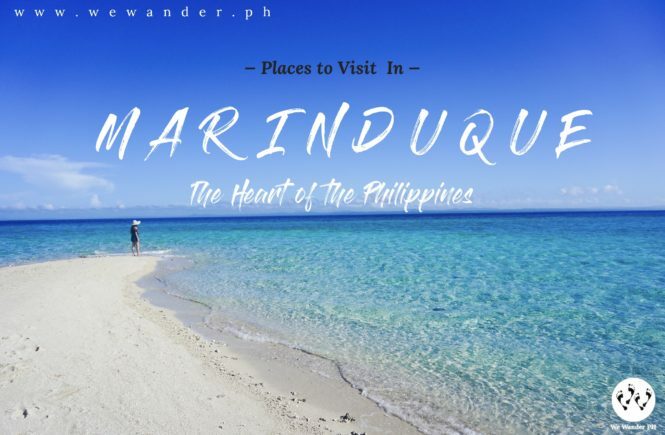 Marinduque is such an amazing place and we believe that the Heart of the Philippines tagline is not just based to its island’s shape or location but because when you experience Marinduque, you will be captivated. It will be hard to say goodbye and all you will wish for is to stay there a little longer. 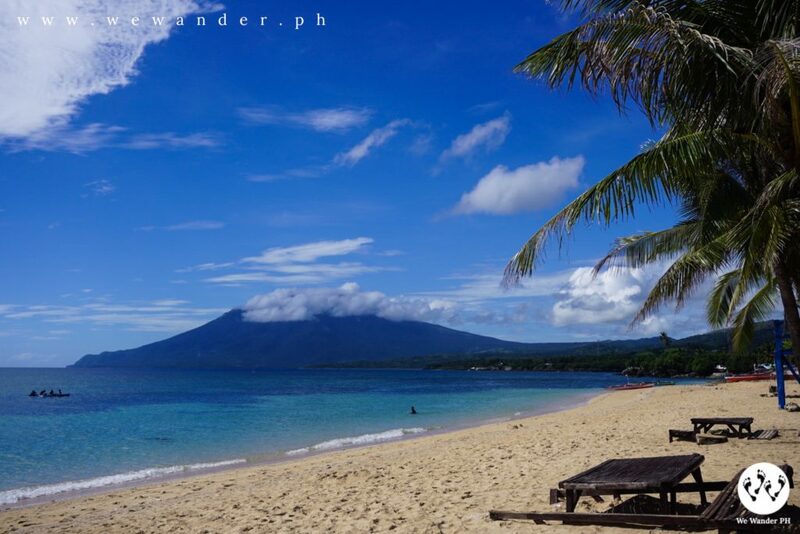 That is Marinduque, an irresistible paradise. 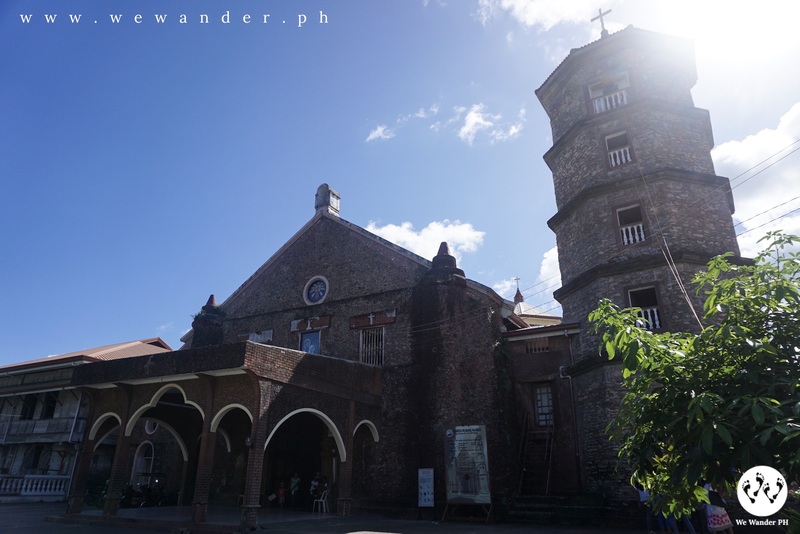 There are many routes and trips you need to consider in going to other places and towns of Marinduque. The common transportation from town to town are jeepneys and van. There are jeepneys with regular trip schedules from Balanacan Port to Boac. Travel time is about 30 minutes for P47 fare rate. You may take a ride from van or jeepney bound to Sta. Cruz. From Sta. 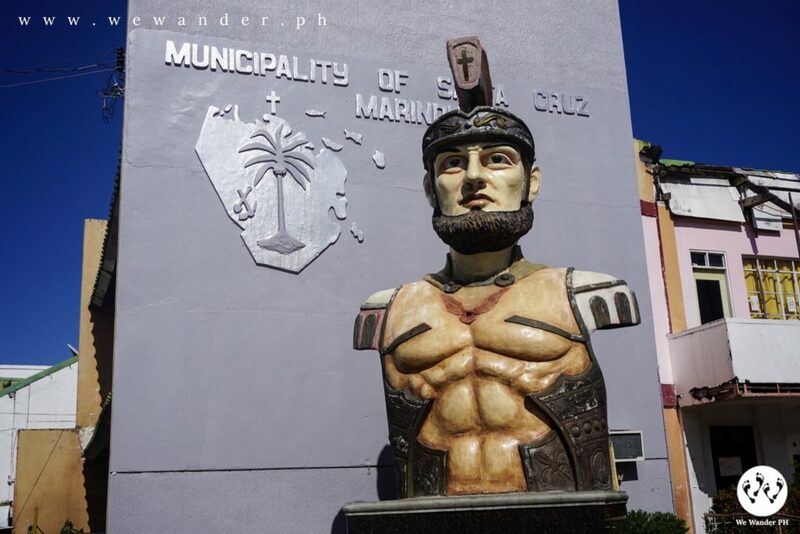 Cruz town proper (landmark is the huge Moriones Statue), ride a tricycle to get you to Buyabod Port where you can arrange your boat for Maniwaya Island. Ride a van or jeepney heading to Sta. Cruz then transfer to another jeepney bound for Torrijos where Poctoy White Beach is located. Ride a jeepney bound to Torrijos and then from there you can opt to ride a tricycle to get you to Poctoy or take another jeep bound to Sta. Cruz. Ask the driver to drop you off at Poctoy White Beach. There are jeepney schedules heading to Sta. Cruz from Boac. Ask the locals on the trip schedules and the terminal. 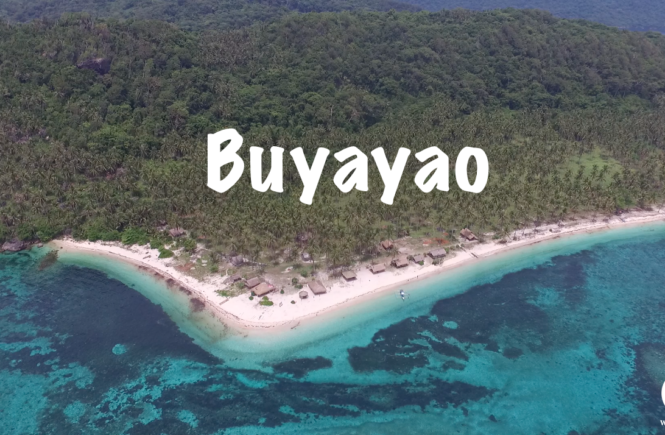 If you are planning to go to Tres Reyes Islands, you need to ride a jeep from Boac to Gasan and tell the driver to drop you off in the port where you can arrange for the boat rental. 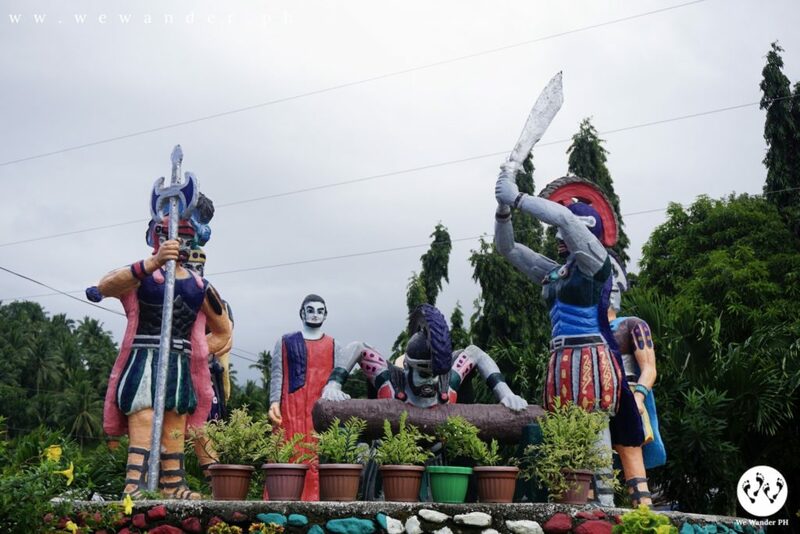 Moriones Festival is being held during Holy week (March or April). Expect crowds during this peak season. The expenses includes the fares, entrances and boat rentals. Food expenses has been excluded due to preferences. 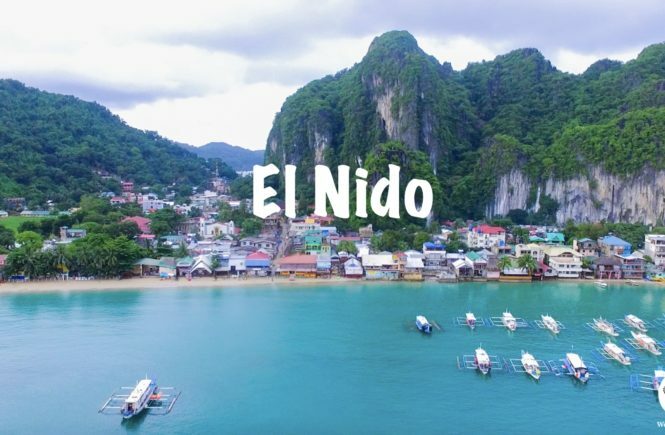 Yung boat ride to Maniwaya na P1,500, balikan-roundtrip na yun? puwedeng kinabukasan na balikan? The sample estimated expenses worth P3,290 is per head basis excluding food. The boat rental is not P1,500, it ranges from P2,000-P5,000 to be shared by the number of members in a group. We got our boat for P2,000+ good for two last December 2017 (haggled price). Price may change during peak seasons. Thank you for reading the article and dropping a comment! Unfortunately, we couldn’t retrieve our note to check the contact details of the boat owner. You may assume that the boat rental may range from P2,000 and above from Buyabod Port. Ayos lang po ba pumunta dun magisa? Di po ba magastos masyado?